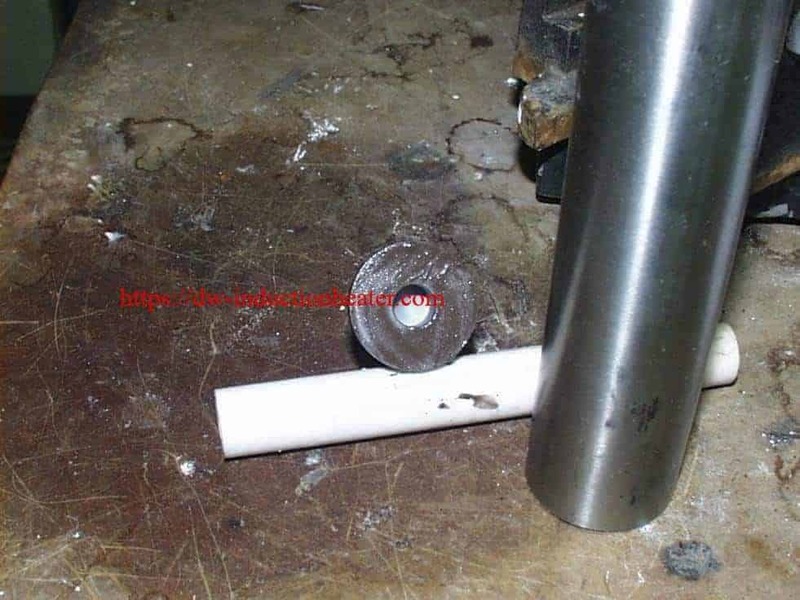 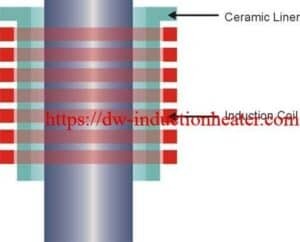 ceramic liner is used so the rod does not touch the coil. 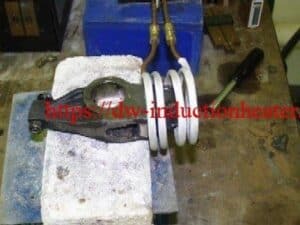 Process A three turn helical coil is used to braze the carbide to the shaft. 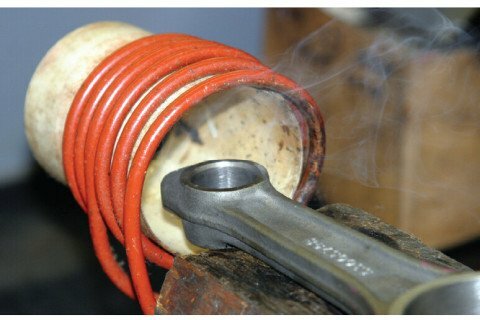 The steel shaft is fluxed and the braze shim placed on top. The carbide tip is fluxed and placed on top of the shim, lining up the countersunk hole in the carbide. 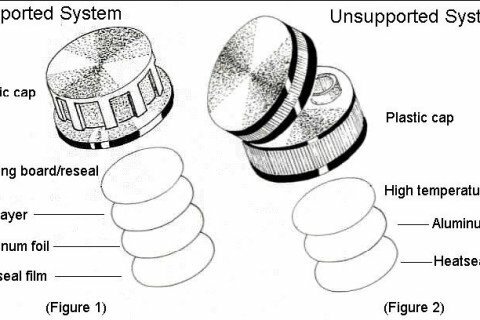 The hole is not fluxed because the flux outgases and causes the carbide to build up pressure and attempt to repel from the shaft. 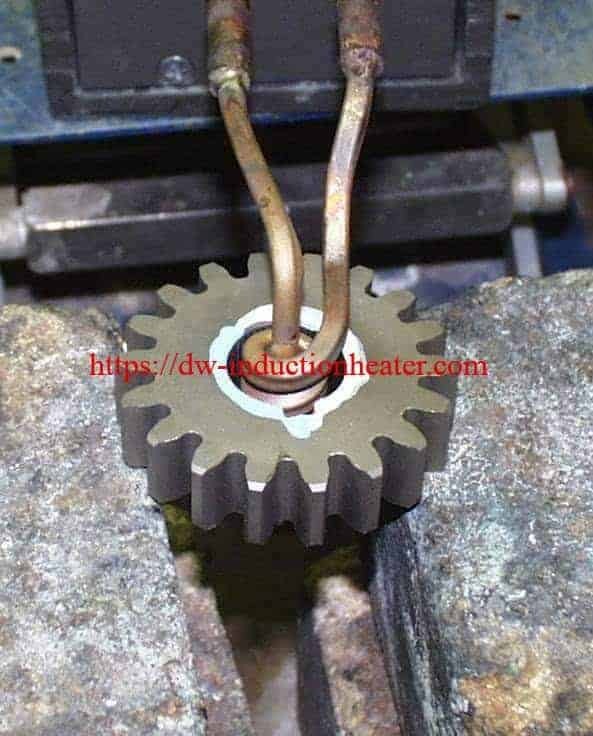 Power is applied for 85 seconds for the braze shim to flow and make a good joint. 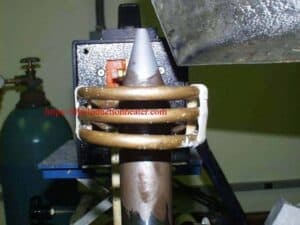 DAWEI’s customer has a customer who is unhappy with the braze quality of their digger so our customer is looking for a better quality brazing process. 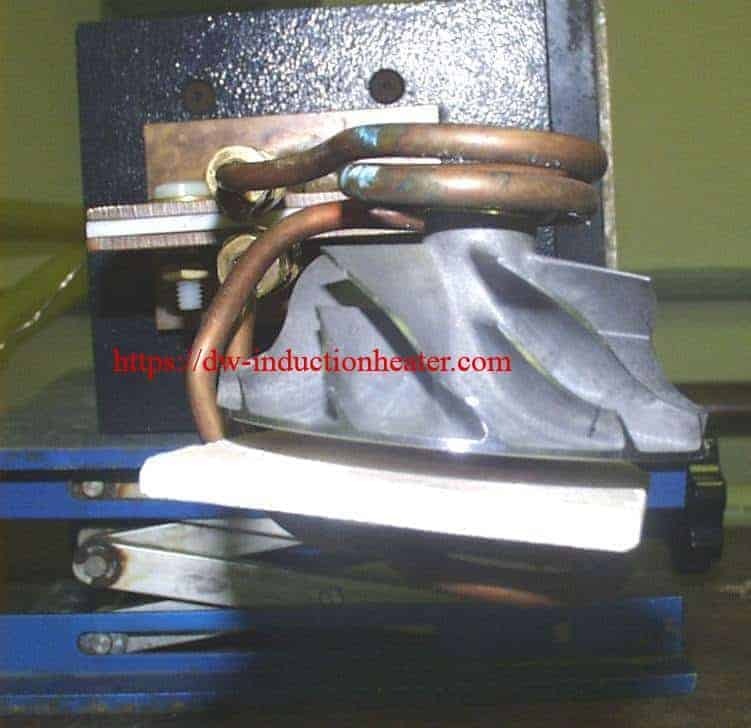 DAWEI’s customer is very happy with the sample brazed diggers and the help he received from the Ameritherm lab in developing his brazing process. 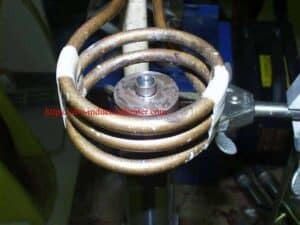 Process A three turn helical coil is used to heat the steel valve seat. for the shrink fitting process. 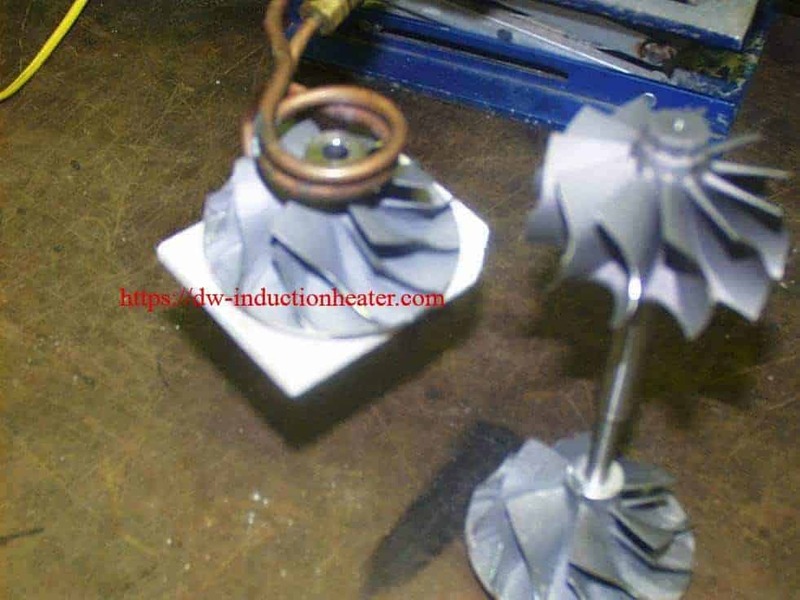 Objective Heat aluminum impeller blades to 200 ºF (93 ºC) and shrink fit onto a shaft. 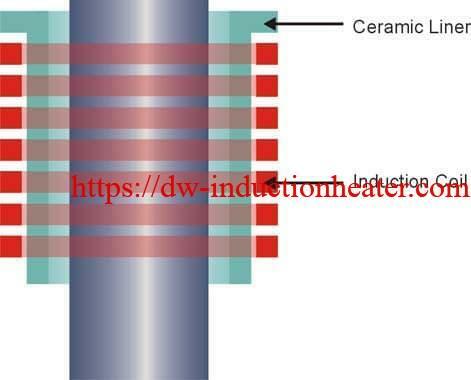 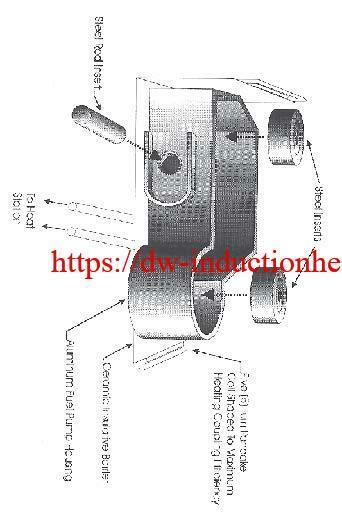 Equipment • DW-UHF-6W induction heating system, equipped with a remote workhead containing one 1.0μF capacitor. 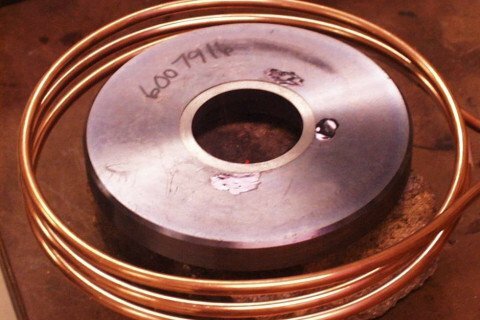 Process A split two turn helical coil is used to evenly heat the opening on the impeller blade. 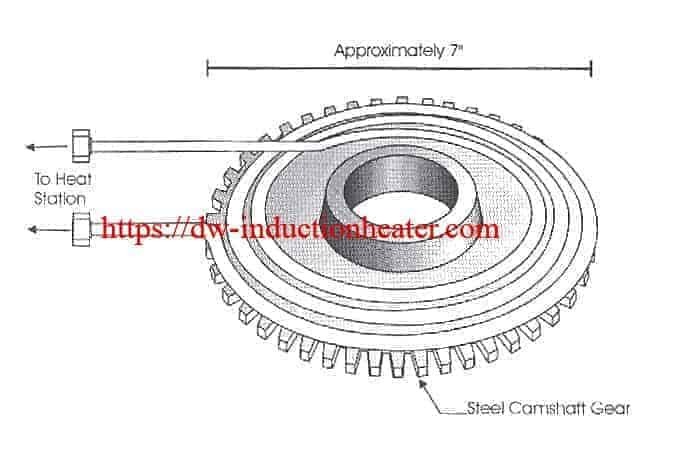 The impeller blade is heated for 20 seconds to reach the 200 ºF (93 ºC). 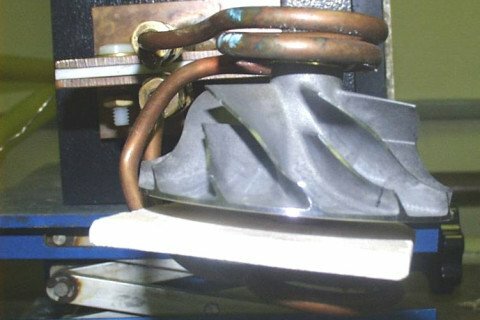 The impeller blades are then removed from the coil & slipped over the shaft to complete the shrink fitting application. 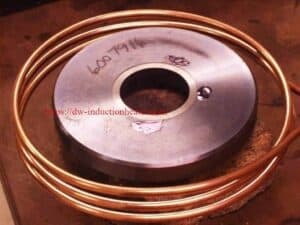 Process A three turn helical coil is used to heat the aluminum pulley. 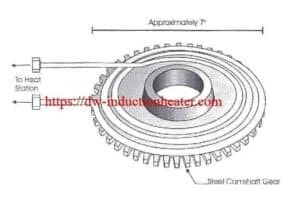 The pulley is heated to 464 ºF (240 ºC) in 20 seconds to expand the inner diameter and then the inner bearing is inserted to form the completed part. 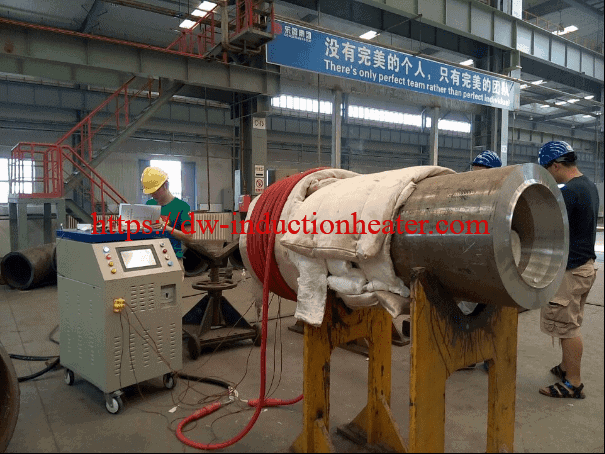 Process A six turn helical coil is used to heat the connecting rod for 13 seconds. The coil is perpendicular to the axis of the bore to promote even heating around the circumference. 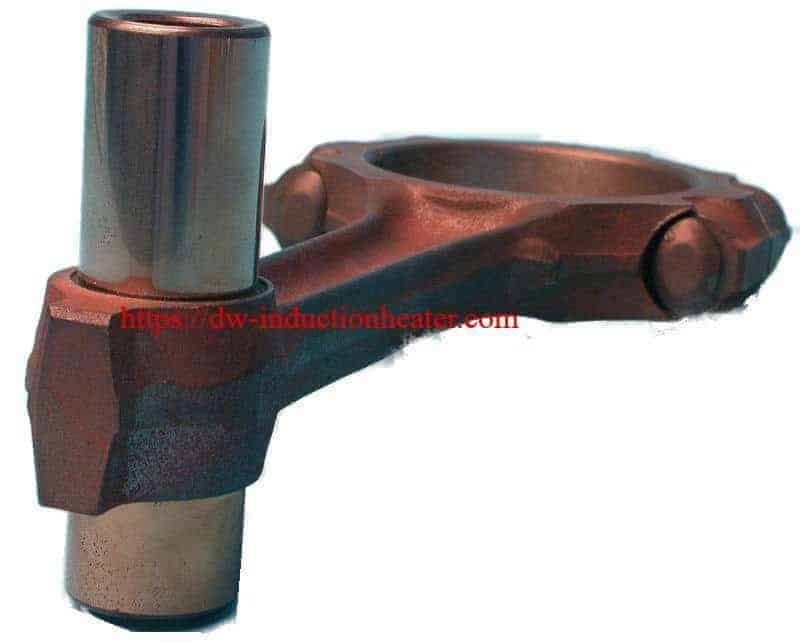 The connecting rod is then assembled with the piston for shrink fitting. 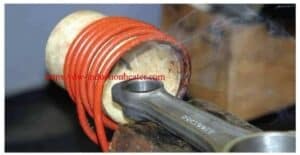 • More accurate control of heat vs a flame burner. Only heats knuckle, not the whole part. 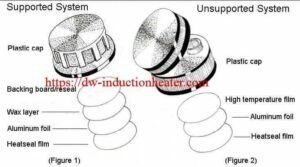 • Lower temperature used to prevent discoloring. 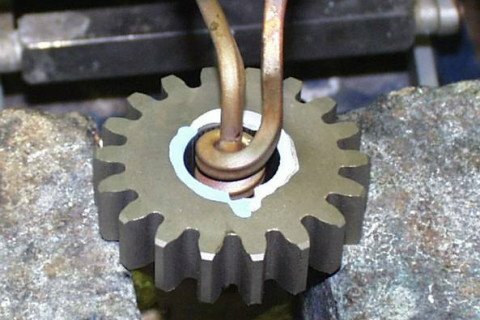 • Increased productivity due to repeatability & ease of operation. A foot pedal & timer is used. on a hot plate. The hot plate heating cycle lasts for approximately 45 minutes. 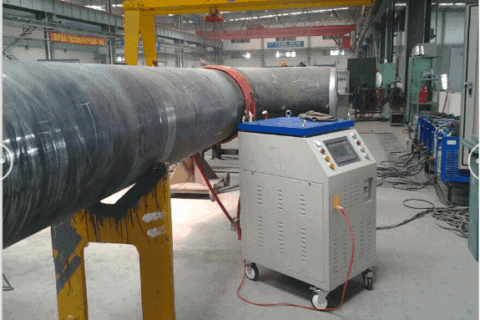 The customer would like to explore the options available in terms of heating times and machine size. 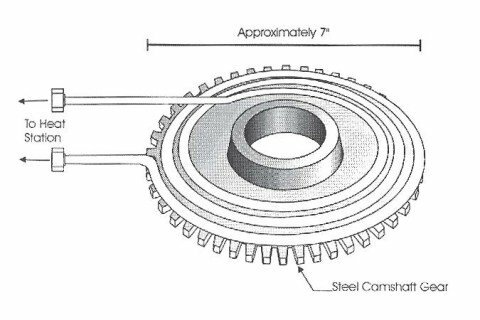 Material: Steel Camshaft Gear measuring 7″ in diameter, 1″ thick, with a bore size of 1.630″. 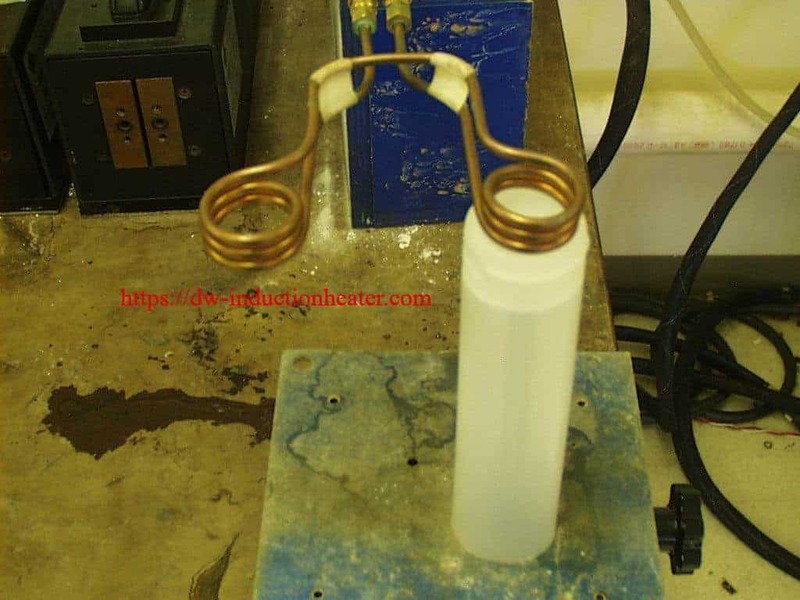 – 5000F was reached in three (3) minutes while using the DW-HF 5, 5 kW output solid state induction power supply. 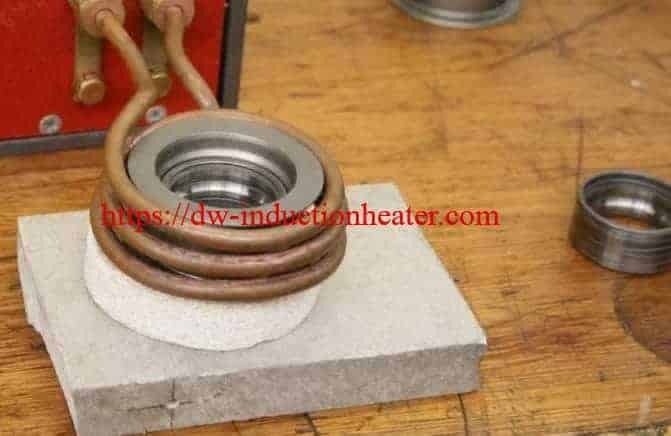 – 5000F was reached in five (5), eight (8), and ten (10) minutes using the DW-HF-3, 5 kW output solid state induction power supply. 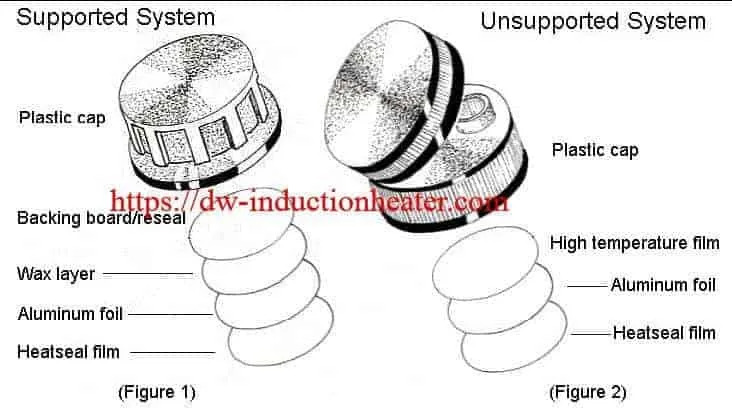 – Even heating was observed as a result of the unique three (3) turn helical induction coil. Equipment: DW-HF-35 and DW-HF-55 kW output solid state induction power supplies respectively, including remote heat stations and a unique three turn helical coil made from 3/16″ copper tubing and having a 4.4″ inside diameter. 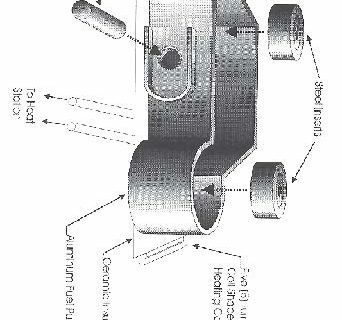 period of time to complete the process. 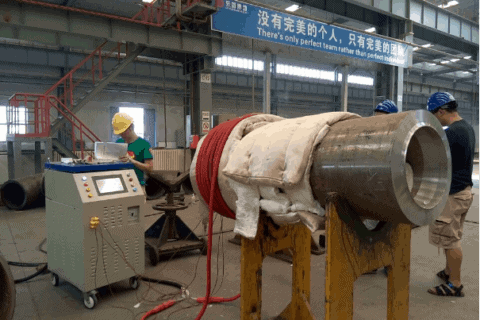 Application: By using the DW-HF- 25, 25 kW output solid state induction power supply the following results were achieved. 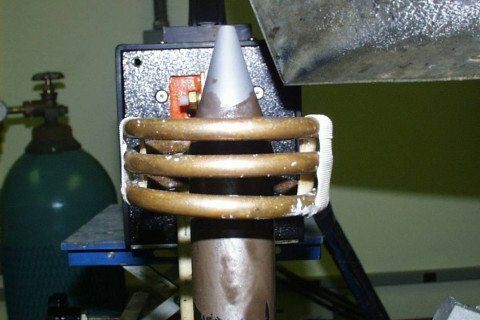 – 3750F was reached in one (1) minute to allow for insertion. 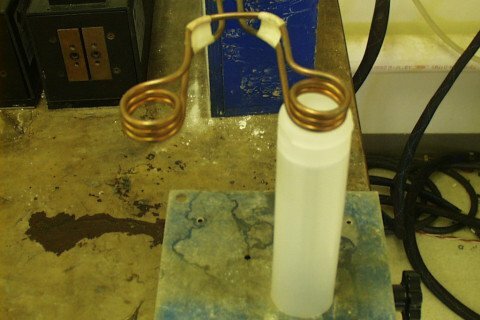 – 20 housings were successfully heated using a five (5) turn right angle pancake coil. 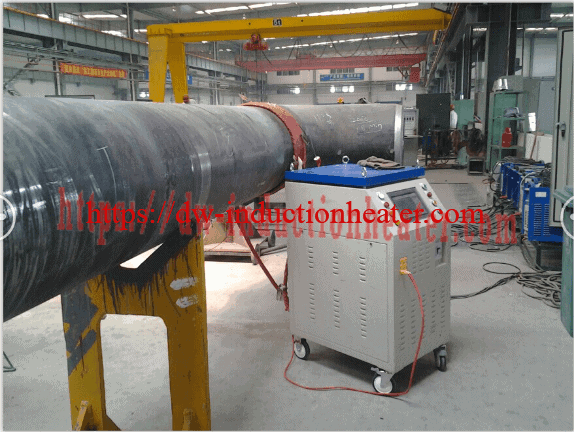 Equipment: Ameritherm SP 25, 25 kW output solid state induction power supply including one (1) remote heat station containing four (4) capacitors totalling 1.0 μF, and a five (5) turn right angle pancake coil made from 3/16″ copper tube.